I loved IT! This is one of my favorite movies of the year. I'm pretty sure this will make my top 10. I'm actually listening to it's soundtrack as I write this. 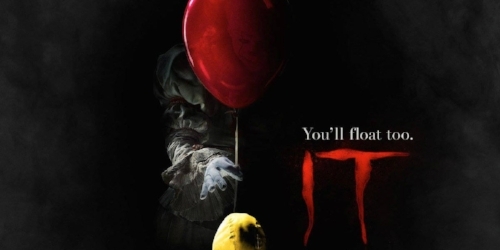 I wasn't sure what to expect from this reboot from director Andy Muschietti given that his first and previous movie Mama was met with mixed reviews. Well...Muchietti brought his A game! From the first sequence, I could tell that this was a very well directed film. The control of pacing, tone, and camera work is noticeably solid. Speaking of bringing his A game, Bill Skarsgard nails his portrayal of Pennywise the Dancing Clown. He had some big (clown) shoes to fill (hahaha I'm so funny), but he actually manages to match Tim Curry's memorable performance in a way that is his own. His expressions and movements are all so creepily off putting! However, the biggest praise for this movie has to go to the Loosers Club. The handling of these protagonists is fantastic. The casting, the acting, the development...all strong. These kids are genuinely hilarious and realistic. All this makes you care for them and connect with the story. I wasn't expecting this film to have so much heart and humor; but, it really does and all for the better! Jaime from The Fresnerd educated me that the book is mostly a coming of age story. If that's the case, then this movie captured that very well. This is Stranger Things meets Stand By Me meets A Nightmare on Elm Street. All this with lovable characters. Also, Benjamin Wallfisch created a great soundtrack. His pieces stand out and fit so well with classic 80s horror / drama feel of the movie. I probably shouldn't be listening to this before I go to sleep, but oh well. As for flaws, my group of friends did walk out thinking that it could've been scarier. I wasn't sinking into my chair as I have with other favorite horror movies. However, there were plenty of deep gasps and occasional screams from the audience. In addition, I wonder if my expectations were too high because on second viewing I actually did find it scarier. I think this movie is more creepy/disturbing than terror-filled and perhaps that's what the aim was of the filmmakers. Another flaw was that a couple of the kids' actions seemed a bit extreme and overboard, as if the plot required them and not their own logic. Lastly, the special effects are predominantly done well, but in one or two scenes the CGI is a little poor. I loved this movie! A- for me. What did you guys think?